This post include Defence -military related Mechanical Projects for engineering Students. The military robot utilization of robotics technology for fighting terror and defense of the nation. The human lives are highly valuable, the soldier lives more important to stay us alive in the combat field. The robotics technology so highly developing the robot is named as the unmanned ground vehicles. In the military application, the latest technology is the drone without pilot the drone is controlled in the base of the military center and far distance everything in the high-speed internet to access the drone. There are different kinds of robots that are specifically employed for doing special tasks in military applications. In military services, there are some areas in which some of the tasks involve greater risk and danger, and therefore, those tasks must be performed without military personnel, solely by the robots. Fire-fighting robot is implemented as a fire engine to extinguish the fire. 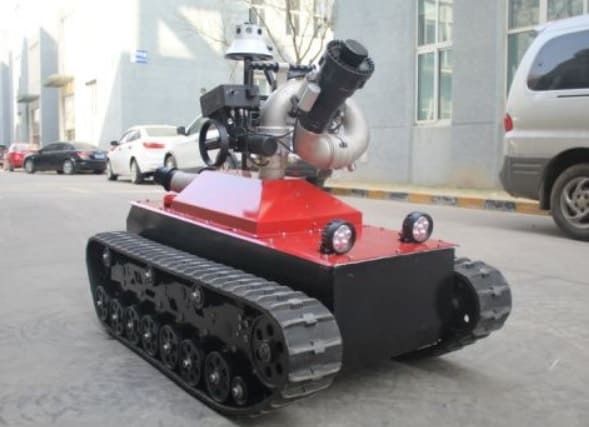 This type of robot is used in military as well in other sectors for extinguishing fire if it happens by accidents such as train accidents. The robotic vehicle consists of a water tank and a pump to sprinkle water. Similar to the above project, this robot can also be controlled by using an Android-based application for remote operation purpose, but – also requires another motor driver and a motor to operate the sprinkle arm in a desired direction and a pump to increase the pressure of water. This robot is useful to find landmines in the ground by sensing them while moving a vehicle ahead. A metal detector circuit is attached to this robotic vehicle to detect metal parts in the ground. The Remote operation of this vehicle to control the direction can be possible with an RF-based remote as transmitter that sends commanding signals to the receiver circuit. The main aim of Defence ( Army ,Air force ,Navy )is to guard the border and to ensure that no ANE, infiltrators or smuggler enters our country. Defence is deployed in very hard and sensitive areas at Border as well as for internal security duty. Keeping in view the area of responsibility given to Defence and availability of man power some times it is not at all possible to guard some vulnerable point round the clock, at that time it becomes imperative to develop an electronic system through which the unmanned air craft can been operated. To over come this problem, we have designed a unique system i.e., remote controlled firing and monitoring system. which can be fly over our area for vigilance and is capable to fire remotely whenever any unwanted person enters an unattended point / place.